Search and adopt a Chesapeake Bay Retriever near you. The Chesapeake Bay area has been famous for its first-rate duck hunting ever since the first settlers set foot on shore. 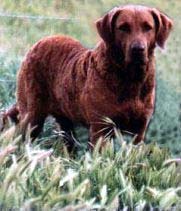 Retrievers have always been in demand by the Bay and, for many years, each hunter simply used the best dog he could find bred from other dogs who worked well. The Chesapeake dog was not an overnight creation, taking much of the 19th century to develop.